"The essence of the economic case for migration is very simple: it is the same as the case for markets in general. If people take decisions on the basis of their own economic self-interest, this will maximise overall welfare. This applies to where people live and work just as much, if not more, than it applies to buying and selling goods and services. Of course markets fail here, as elsewhere, and "more market" is not always better. But the view that, as a general proposition, markets are good at allocating resources - including human resources - is widely shared among economists. Sometimes I am proud of what some people unkindly call economists' "autism". At other times I despair. This is one of those other times. Importing people is not like importing apples. It's not just "labour services" and "consumer demand" that crosses the border; it's people. And there's a lot more to people than just bundles of labour services and consumer demands, where tariffs and transport costs make the only difference to whether they are inside or outside the borders. Mrs Thatcher was not wrong, but misunderstood. There is such a thing as society, but society is not something that exists apart from the rules of action and belief of the people who create that society on an ongoing basis. We don't just do it once and leave it cast in concrete; we re-create it every day. And as Hobbes said, Total Factor Productivity wasn't so great in the State of Nature. You raise lots of interesting questions. But the answers aren't clear. What if there was an optimal number of people to import a year as a strong function of native birth rates and civilian labor force growth rate, but only a weak function of where the people originate from? How could we find out if such a function existed, and what its sensitivity was to its arguments? Tom: I'm afraid my guesses to the answers aren't much better than anyone else's. Canada has a very high immigration rate, as a percentage of population, compared to most countries. But, touch wood, things seem to be mostly OK, as far as I can tell. But it's a mostly *controlled* immigration, with a points system, which I think makes a big difference, including a symbolic difference. “What is the optimal number of imported tomatoes? Soviet central planners tried to figure things out this way. Americans shouldn’t. We should decide on the optimal terms on which tomatoes can be imported, and then let the market decide the number. Similarly, we should debate what the optimal terms for immigration are – How will we let people immigrate? What kind of people? – so that the vast majority of such immigrants are a net benefit to the US. Then, let as many come as want to. On the right terms, the number will self-regulate. Avon, thanks. Funny that by chance I used the same phrase John criticizes: "optimal number of immigrants." BTW, your previous question was answered, and I suspect this was meant for you. ... funny how my 1st instinct was to contemplate this problem like an "apparatchik in Washington" (according to John). A monopolist faces a downward-sloping demand curve (or a monopsonist faces an upward-sloping supply curve). P(Q), or Q(P). When he picks a point on that demand curve, is he setting P or Q? If the demand curve shifts, would he change P, Q, or both? I think... no, IKNOW that Jonathan would say that you are committing a lump of labour fallacy. How do I know? Because Portes once wrote that he thought explaining the lump-of-labour fallacy to Secretaries of State for Work and Pensions was "probably the most useful thing I did, from a public policy perspective, in my six years as Chief Economist at Department for Work and Pensions." Portes defaults to the fallacy explanation whenever he has to deal with questions like yours. "Oh, you say 'blah,blah,blah total factor productivity...' but what you REALLY are thinking..."
If you have any reservations about immigration, it has to be because you think there is a fixed amount of work to be done. That's all there is to it. Jonathan Portes isn't the only one with this compusion. Alan Manning of the London School of Economics gave a talk on the "Economics of Migration" about a month ago and his "take away" is that people who worry about the effects of immigration do so because they believe in the... ta-da! lump of labour fallacy. Check out the excerpt I made from his talk: https://youtu.be/FfutZTw1nrc Three minutes and 44 seconds going on about the lump. That's the "interpretation" part of his lecture (so labeled in his power point). What would Josiah Tucker say (in Reflections on the expediency of a law for the naturalization of foreign protestants, part II, 1758)? "IV. If we have a considerable Number of Hands now unemployed, for the want of a Demand for their Labour, Which would be the right Policy. To drive out some of the present? or admit more Consumers? "V. Suppose the Expulsion of one half of the People of all Denominations in Great Britain—Would this be a Means of procuring more Work for them that remained? Or would not five Millions more of People increase all Employments and Consumption one half? "VI. Whether Sir Josiah Child did not call it a Vulgar Error to say, We have more Hands than we can employ? Whether he was a Judge of Trade? And Whether it is not an infallible Maxim, That one Man's Labour creates Employment for another?" Nick, were you addressing your 11:26 comment to Avon? Regarding John Cochrane's post? What is the optimal number of imported tomatoes? Soviet central planners tried to figure things out this way. Americans shouldn’t. Tomatoes have a buyer and a seller, while immigrants have God given free will. These things are not equivalent. Dunno where you studied Econ 101, but in the Austrian school, prices are free floating and represent an important market signal between the buyer and the seller. Having said that, if we are talking immigration (which I might just mention is nothing like tomatoes) it just so happens that setting a price of citizenship is indeed a real immigration policy (of a very fringe party). The current approach to immigration is to set a broad quota and then assess applicants for Permanent Residence according to a complex set of criteria. The LDP proposes a change in this “quota” approach to a “tariff”, in which immigration is limited by charging an immigration fee (subject to meeting minimum health and safety requirements). This idea has been championed by Nobel Prize laureate Professor Gary Becker, who argues that a tariff is always preferable to a quota approach on efficiency grounds as it applies price theory rather than bureaucratic procedures. Additional benefits of the immigration fee are that it acts as a form of self-selection as only people with high expected income would apply; it acts as a form of payment for Australia’s public goods that are already in place; and it adds to the economic benefit that the immigrant is providing Australia. All of this has nothing whatsoever to do with tomatoes. @Avon "Immigrants create as many jobs as they take"
Surely part of what underlies populist concerns over immigration is the sense that immigrants run a significantly lower marginal propensity to consume than the equivalent native household, especially in poorer demographics, as a surplus is saved for remittance to the home country. There is a second deflationary effect from the fact that lower-consuming immigrants put a downward pressure on wages for certain jobs. So immigrants do boost employment, but not by as much as you imply. I would say that individual migrants are "price takers" where institutions are concerned, both in their country of origin and in their new country. They tend to be powerless. As are the citizens in Canada - how many of us have any real power to change or control institutions? That's why people feel their vote doesn't count. The thing we probably want to be careful about is that we don't end-up importing broken institutions (e.g. the Baath Party). AFAIK, this hasn't ever been a real problem in Canada. Not sure if it's due to luck or policy or something else. "Sometimes I am proud of what some people unkindly call economists' "autism". At other times I despair." Could you do a more general post on this sometime? The discussion of whether or not immigrants create jobs is largely beside the point. To fix ideas, think about David Card's study of the Mariel boat lift (here). The Mariel boat lift was a more-or-less exogenous shock which swelled the unskilled labour force in Miami by 7%. Card found that this influx of unskilled labour had no negative impact on the wages or employment of other less-skilled workers in Miami. Immigrants don't kill jobs: Q.E.D. But Nick's point is that - even if the conclusions of the Card study are correct and generalizable - immigrants may have long-run effects on social and economic institutions that are either positive or negative. Miami is a very different city as a result of years of Cuban immigration. Better? Worse? Probably better in some ways, worse in others (though I've probably watched too much CSI Miami over the years). consequent organizations to evolve, but the direction of their development has not been to promote productivity-raising activities. There is also a good sized empirical literature (e.g. here) documenting that immigrants bring social and cultural norms with them, retain them for at least a generation or two, and that these social and cultural norms have real impacts on people's economic decision-making. As an aside - Canada has a more positive attitude towards immigrants than just about any other country in the world - see, e.g. here. Frances: "The discussion of whether or not immigrants create jobs is largely beside the point." Canada, Australia, New Zealand have very high percentage immigration, but it's very controlled immigration. That makes a big difference, including symbolically. "We invited them to join us. They asked our permission." Of course institutions matter. Canada's reliance of free(ish) markets and the rule of law are almost certainly the most important determinants of our wealth. A priori, there is no sense in which immigrants undermine our institutions. In countries that have serious problems with immigrant integration we find large welfare states which effectively institutionalize racism. (Of all the transfers to citizens in France with free/low cost post-secondary tuition, how much of it ends up in the hands of North African immigrants living in the outer banlieues of Paris?) The United States let in huge numbers of people in the 19th and 20th century, with no welfare state, and their institutions continue to work – and to the extent that they don't, it's not because of the immigrants. What does this mean? If we allow people to make Pareto improving trades with one another, rely on markets, and the rule of law, there is no reason to think that the hallmark of economic growth, innovation, will diminish. And however economies might evolve, there is no sense in which economists made masters of the universe can engineer them better. I certainly hope that you don't allow your students to write like that. These were exactly the reasons people gave for keeping the Jews out in the 1930s. So what if different people make different economic decisions? Why should we fear that? What's wrong with places like Toronto, NYC, and London? I agree. What is NOT beside the point, though, is that Say's Law and the lump of labour are invoked ad nauseum by economists discussing immigration (e.g., Jonathan Portes, Alan Manning) AS IF IT WASN'T beside the point -- as if it was THE point. Things change with or with out new people. Taking a stance of keeping out new people will have its own effects on society and institutions, not necessarily good ones. Provided the central bank increases the supply of money in line with the increased demand for money resulting from immigration, we don't have to worry about Say's Law. But yeah, non-economist critics of immigration generally won't get that point. JKH: "Could you do a more general post on this sometime?" I would like to try, but it might be very hard to do well. Tom: yep, the P&Q stuff was a response to Avon. The problem with David Card's Mariel study is its reception. Card took an innovative approach and he qualified his findings appropriately. But his research is cited as if it is definitive PROOF of a generalization that it does not purport to prove. It is appealed to out of proportion to its definitiveness. Thoughtful research has been hyped to the status of dogma through appeal to authority. louis: yep. Could be good or bad. But humans are not good at doing quick institutional change, because there's a coordination problem, where history matters. We might end up with conflicting institutions, or none at all. It makes sense to take it slow, to allow time to adjust and blend. "Provided the central bank increases the supply of money in line with the increased demand for money resulting from immigration, we don't have to worry about Say's Law." Provided the central bank knows what the supply of money will be and what the demand for money will be in the near future... Actually we don't have to worry about Say's Law anyway because, as J.-B. himself pointed out, whatever does not create its own demand is not supply. It's a tautology. I think it's a matter of network effects, assimilation costs, and insular subculture formation. It's not at its root a story about immigration -- everything discussed in this thread can also apply to the questions of (say) Jewish minority groups in medieval and early modern Europe or the prospects of black Americans after the end of legal segregation. *) The benefits of non-assimilation: the quality of life possible while remaining essentially distinct from broader society and integrated in one's minority groping. Policy influences all of these variables. Filtering out immigrants with poor chances of assimilation, for example, reduces the average cost of assimilation for immigrants who are accepted. On the other hand, ineffective filtering (such as the US's porous southern border) causes these administrative barriers to *raise* the cost of assimilation: an illegal immigrant in the US essentially cannot fully and legally join the majority workforce, taking the choice away from them. Similarly, the presence of absence of de-facto discrimination puts its thumb on the benefits side of the equation. If a society is patently racist, even a nominally-welcomed minority immigrant may be confined to a ghetto. The level of immigration is only a secondary concern here, in that it takes a certain critical mass of a distinct minority group before an insular subculture is possible. It's the ghettoization of minority groups that is then the problem, because these groupings allow competing institutions to develop in a protected environment. That might not actually be a bad thing (see Jewish moneylending throughout pre-modern Europe), but simple reversion to the mean suggests that on average it is a bad thing for nations that begin with high-functioning institutions. Conflict between these quasi-institutions and the mainstream then can undermine a nation's unity -- see for example the relative inefficacy of police services in areas controlled by the competing quasi-institutions of gangs and/or the mafia. To look at this problem in a Canadian context without much reference to immigration proper, look at the language laws of Québec -- these are designed both to encourage linguistic assimilation of non-Francophones and to resist linguistic assimilation of French-speaking Québec into a broader English-speaking Canada and American hegemony. You make a good case against overwhelming "open the floodgates" change, and for showing preference to groups likely to harmonize more easily with the existing institutions. I just want to make the contrary point that introducing diversity increases the resilience of a society and exposes it to new ideas. A more diverse society will likely also be more apt to develop links with other nations and adapt to global changes. Immigrants to the US in the 20th and 21st centuries have been a major source of positive social dynamism and have contributed to a cultural acceptance of pluralism as people become used to working with other from different backgrounds. I believe strongly that the quality of life in Switzerland, Singapore and the U.S. would decline for the current residents if they allowed unfettered immigration. China discovered that average welfare can improve with reductions in population and took action accordingly. For the benefit of my children, I'm willing to sacrifice the discomfort of a temporarily high ratio of retirees to workers (as the baby boomers move to retirement in the U.S.). "I doubt that the U.S. real per capita income would benefit from more immigration." Take a look at this plot. 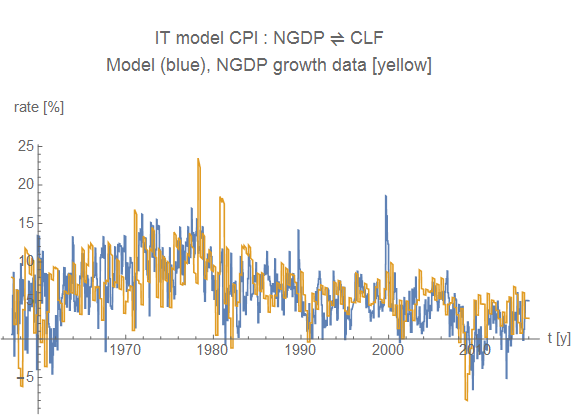 The "model" in the title is really just a simple (theory derived) monotonically increasing function of the Civilian Labor Force (CLF) with two parameters adjusted for best fit with NGDP, and then rates calculated. I don't know what the CLF does as a function of immigration rates, but I'd guess it would increase it. And I know that's the NGDP growth rate in the plot, not "real per capita income." Frances, George Borjas's more recent and disaggregated study of the Marielatos boat lift effect tells a rather different story to Card's. Speaking as the resident from a country which has (proportionately) a higher income take than Canada's (among OECD countries, only Israel and Luxembourg have a higher proportion of the population be migrants + children of migrants than Australia), two points keep getting overlooked. (1) Voters hate illegal immigration because it means they get no say in something that is very important for the future direction of their country. If you don't want your migration debate to go feral, have border control. (2) A migration policy justified in the public interest--and so selective towards those most likely to contribute--can get public support. In particular, ensuring the migrants bring a reasonably high level of capital (such as human capital) with them counterbalances any downward effect on labour incomes. The US has neither border control nor a coherent migration policy. Hence, particularly given economic distress, a migration debate that tends to go feral. Europe has massive border control policies and migration policies which are a series of ad hoc expedients--they are creating voter anger and social dysfunction. The benefits to migration tend to accrue at the higher end of society, the costs to the bottom. This differentiation in effects is one of the reasons migration can be so politically divisive. Sandwichman: "If you have any reservations about immigration, it has to be because you think there is a fixed amount of work to be done. That's all there is to it." That would be Autism, even leaving aside the the balance of labour and capital makes a difference to labour incomes. It is quite clear, for example, that large-scale Muslim immigration (I mean heading up towards 10% of the population) is a de facto decision to export your Jews and reduce the practical social rights of your queer citizens. Not all groups play well with others. Folk bring bundles of preferences and expectations with them. The bundles of preferences and expectations associated with mainstream Islam are problematic, (various dissident streams of Islam--Ismailis, Alevis, Ahmadis, etc not so much) and are the more problematic the more "critical mass" enclaves are acquired. The habits of civil society and democratic government take time to acquire. Assimilating to the local culture takes time: being a high trust, shared expectations culture has real benefits. Importing great lumps of particular cultures encourages taking refuge in the original culture. Another reason why Australia and Canada's migration policies work is their diversity--having folk from lots of places (diverse ethnicities, language groups, religions) reduces that effect. "Canada has a very high immigration rate, as a percentage of population, compared to most countries." Perhaps Canadians can blame Gordon Lightfoot's "Canadian Railroad Trilogy" for inspiring the flow of new immigrants. It certainly stirs me up. Not sure about the direction of causality in the graph. I would expect more people to bring greater total income, but the whole question to me (I'm not all that altruistic) is what happens to well-being of current residents, not total income. And total income needs to be further adjusted for other costs that come with more people crowding a given space, including traffic congestion. For example, such costs seem to have changed the desirability of living in sunny California compared with cloudy Oregon. We probably need to be more careful with our definitions. Canada has a high immigration rate compared with various other countries. It does not have a high immigration rate compared with historic trends and stated targets. Over the last 25 years, immigration (not net of emigration, mind you), has been as low as 216,000 (1990), as high as 262,000 (2005). Completed immigration for 2015 is estimated at 260,000, so quite high, but is a smaller proportion of the total population than the 1990 figure, at 0.73% compared with 0.77. Canada's target, such as it is, is 280,000ish. This has never been reached. Avon calls for a supply-and-demand based immigration rate. Well, we've put our demand before the global labour market, and the price that we're prepared to pay, and it looks like the price is too low. It's not quotas, but what we're prepared to pay which determines the supply. Yes, we could probably get more if we staffed Immigration Canada better, but, well, that's part of the price we're prepared to pay, and, at that price, this is what we get: below target immigration. Well, congratulations, because we've got that! As for losing our Canadian values due to waves of foreign immigrants, all I can do is point the curious in the direction of the history of Canadian immigration. Per this table, four half-decadal periods have a contribution from immigration likely to be larger than the current half-decade. I invite attention to which half-decades those were, and further upon the subject the wise course would be to say no more. From the abstract: "A growing empirical literature supports the importance of strong private property rights, a rule of law, and an environment of economic freedom for promoting long-run prosperity." Translation: "We examine how migration impacts countries’ economic institutions using the [Fraser Institute] Economic Freedom of the World Annual Report..."
Can one help having the impression that the term "long-run prosperity" is a persuasive one that conceals a value judgement? Or that the authors are finding the institutions they prefer to be "better" because that's the premise underlying the persuasive terms they elect to use? In "The Foundations of Welfare Economics," (1949) I. M. D. Little conceded that there is "no reason why we should not make persuasive definitions if we want to," but, he went on to warn, 'we should realize what we are doing." Perhaps the authors of the article don't realize what they are doing. In that case, their analysis and conclusions are unreliable. On the other hand, perhaps the authors do realize what they are doing. That would be worse; their analysis and conclusions would be untrustworthy. Prosperity is very difficult to measure in a universal and absolute manner. I don't know if I'm better off than my grandfather... he could afford a much nicer house than what I can afford even though in the scheme of things I have a much more impressive jobs-market skill set. Then again, I have more computers than my grandfather did, so maybe that compensates, or perhaps not, hard to say. However, within a given time frame, and strictly in a relative sense, we see a lot more people wanting to come to Western democratic nations, than we see people wanting to leave and go to third world trash dumps. This would be a revealed preference I think, on a "vote with your feet" basis. Possibly at some stage this trend will reverse, when first world economies become sufficiently stifled with over-regulation and socialist wealth transfer scemes that the relative freedom of the third world looks like a better option. Hasn't happened yet. Seems like there's a lot of ruin in a nation (which doesn't mean it cannot be ruined, just takes time). @Nick: "the effect of immigration on the unemployment rate, both theoretically and empirically, seems to be about 0"
I'd have thought you could argue that the unemployment rate as a percentage might actually rise, as the increase in AD was less than the increase in AS, but even granting the point that the rate remains unchanged, what if the unemployment rate for immigrants were lower than the unemployment rate for natives? Ie the rate remains at 5% but the number of unemployed natives increases. The argument for this would be that immigrants have a greater work ethic or skill level than some of the natives. Has any work been done on this question? Anecdotally the picture seems to vary widely by nationality of immigrant: in the UK, Somalis tend to suffer higher unemployment whilst I believe Poles have lower. Re the Ryan Murphy article (which can be found ungated at http://object.cato.org/sites/cato.org/files/pubs/pdf/working-paper-19_2.pdf - there's a literature out there that argues that it's harder to build support for universal public provision of stuff when the population is more heterogeneous. E.g. in a world where every child plays hockey, it's relatively easy to get people to agree that it's a good idea to use public funds to build local arenas and ice surfaces where kids can play hockey. In a world where some children play hockey, some baseball, some cricket, some basketball, etc etc it's harder to build a consensus around any particular type of public provision. Therefore we would expect immigration - to the extent that it leads to greater population heterogeneity - to lead to lower levels of government provision of goods and services. Given that the authors of the piece Ryan cites use the Fraser Institute's economic freedom index as their measure of institutional goodness, it's not surprising that it gives this result. Also to the extent that immigration has at least a temporary dampening effect on wage growth - and it's really hard to believe that employers would be so enthusiastic about Canada's temporary foreign worker program and various provincial nomination programs if there weren't some wage growth effects - it's not unlikely that immigration levels are endogenous to Fraser Institute style "economic freedom." "Therefore we would expect immigration - to the extent that it leads to greater population heterogeneity - to lead to lower levels of government provision of goods and services." Why is this a problem? It that what we mean by institutions - how much redistribution the state does? The institutions that made us wealthy had nothing to do with "institutions" of the welfare sort. And even if you can get high support for redistribution in a homogeneous society, is it a harmless idea anyway? "Also to the extent that immigration has at least a temporary dampening effect on wage growth - and it's really hard to believe that employers would be so enthusiastic about Canada's temporary foreign worker program and various provincial nomination programs if there weren't some wage growth effects - it's not unlikely that immigration levels are endogenous to Fraser Institute style "economic freedom." "
But didn't a Pareto improving trade happen? People who wanted to work for someone at a wage they were willing to accept? These are pecuniary effects, not true externalities. Should we stop innovation on the same grounds - that remuneration to semi-skilled labour might go down? "But having said all of that, I quickly searched through Ryan's article for the word "robust". Couldn't find it." Yeah, yeah, fine. This guys regression isn't done right, etc. Yes, it's important to do econometric right, but this experiment has been done with the United States. Huge levels of immigration and the outcome resulted in massive prosperity. That story is repeated around the New World for countries that have the rule of law. Just like the natural experiments of North and South Korea, East and West Germany, let's not miss the forest for the tress - there is a big important effect with economic freedom going on here. More to the point, we have a theory on how freedom and choice lead to prosperity - it's not just blind empirical measurements. "Also - before you place any faith in results derived from x-country data." Yes, but most empirical research is wrong anyway. If you only publish positive results, which is what most econ journals do, then a huge, order one fraction, of those results must be wrong, whether they report robust standard errors or not. That pesky type I error compounds beautifully with selection bias - and that far outweighs econometric Godliness. There is a reason that physics will not accept discovery unless the signal is at 5 sigma or higher. When the gravitational wave discovery comes out later this week, that discovery will be over 5 sigma. Avon: "But didn't a Pareto improving trade happen?" I can't speak for my co-authors, but a few points. One is that Table 5 breaks down where it is having an impact. "Area 1" is size of government. The effect is actually coming from Area 2 (legal system and property rights) and Area 5 (Regulation). I have some experience with these regressions and robust standard errors don't do much. If I reproduce Regression 11 and add ", robust", then the standard error goes from 0.813 to 0.851. It stays *** significant. Yet the pretence continues unabated. It is the critique that appears to have been forgotten. The concept of Pareto improvement "could apply strictly only to a community of perfectly consistent individuals, in which no one died or was born." Pareto used a extremely fanciful assortment of assumptions in order to demonstrate the hypothetical superiority of market exchange. The heirs of Pareto mistakenly assume that the demonstration also works in reverse: market exchange somehow magically generates the fantastic conditions under which it is superior. This idea isn't even wrong, it is simply bonkers. What is astonishing is not that some people would make such bizarre assertions but that the broader community would think nothing of it, even if they "disagree." while the worst. Are full of passionate intensity. Let's dispel once and for all with this fiction that Vilfredo Pareto didn't know what he is doing. He knew exactly what he was doing. O/T: Nick, can you think of a way to relate your long thin island PPF (apples doing best in the North, with bananas doing best in the South (Great example BTW!)) to this? (i.e. your "shotgun" example). I take a stab in a prior comment. "...if the social planner gives everything to one selfish person: that allocation is Pareto Optimal." Sorry, wrong link. Here's the one. Ryan, are you using xtreg? Random or fixed effects or...? Thanks, Tom. Farmer is mistaken, though, when he says that "...if an allocation of goods is not Pareto Optimal, it is very bad indeed." There is, in fact, an infinite number of "non-Pareto optimal" allocations that would be ethically superior to an infinite number of "Pareto optimal" allocations. So Pareto optimality is an even weaker criterion than Farmer suggests! Pareto's objectives were irreconcilable. He wanted to transcend value judgments -- interpersonal comparisons of utility -- while basing the assessment of collective utility on the aggregation of individual utilities. HELLO? That second objective is a value judgment. I'm not saying it's a "bad" value judgment. People are entitled to their opinions. But it is inconsistent with the proclaimed "scientific" intention. I am of the view that it is better to acknowledge one's priors rather than to pretend that they are self-evident, unquestionable and objective. To do otherwise is either foolish or dishonest (or both). That's MY value judgment. xtreg. Punt Stata. Use R! And so concludes another episode of why you can never win arguments on the internet. Tune in tomorrow for "Scientific socialism: how scientific is it?" Quick! Look here! Someone on the Internet is wrong! Oh the humanity! Avon, looks like David Glasner was interested in some of your comments in a prior post. Avon, check out David Glasner's latest post: "There Is No Intertemporal Budget Constraint." You're quoted there several places. Frances, the regression I mentioned used long differences. The long differences are really the core of the paper. We later had a two period panel with fixed effects. This is getting sufficiently wonkish that maybe we should switch to email....? I do understand that London is no longer England but the question is, is London worse than England? Being a small country relative to US/Canada etc, its institutions/society have been affected significantly by the immigrants. Has the institution/society become weaker? Canada and US also provide good examples of measuring such impact. US has cities that have a large immigrant (read non-white) population as someone mentioned Miami and cities where the native population is dominant. And we can use it as a proxy for controlled experiment to how the immigration has affected society/institutions. Jonathan Portes’s claim that immigration necessarily maximises “overall welfare” is very questionable. For example given the small proportion of Muslims who go out to work in the UK, and given their lack of skills, the idea that they improve the economic welfare of the UK is plainly absurd, though obviously they improve their OWN welfare when moving from the average (relatively poor) Muslim country to Europe. That explains (revelation of the century this) the migration people from Muslim countries to Europe (and the US). This is a good article, not because it asked the right question but because it is leading to the right question. If you are concerned about the effects upon social economic cultural institutions, the very first question you should ask is,"What are their current states and what do we perceive their optimal states to be". You have to know where you are where you want to be before you can assess change rates. Next you should fully recognize the importance of the above institutions. Culture is pretty much all that separates the civilized from the barbaric and it is very malleable. Do we currently clearly promote values such as honesty, ethics, civility, adherence to rule of law, nonviolence, conflict resolution that is nonviolent and under law, that sort of thing. Or do we quietly allow signals that suggest such things are for fools? In any case, anything that is widespread, not just immigration, can have an effect and until there is a conscious acceptance of the importance of culture and a recognition of its malleability, we are doomed to be on a drifting entropic ship, hoping we avoid the rocks. Nick makes a very good point: immigrants are not mere "factors of production," but full blown people. Avon Barksdale "answers" this by... treating them as mere factors of production! @Ibrahim Khalil: "I do understand that London is no longer England but the question is, is London worse than England? Being a small country relative to US/Canada etc, its institutions/society have been affected significantly by the immigrants." In terms of population (which is what is import here) the UK is much larger than Canada. "US has cities that have a large immigrant (read non-white) population..."
Here in Brooklyn, we have whole neighborhoods filled with Eastern European... well, until I read the above, I would have called them immigrants, but I can't, because they are white?! Pareto's objectives were irreconcilable. He wanted to transcend value judgments -- interpersonal comparisons of utility -- while basing the assessment of collective utility on the aggregation of individual utilities. HELLO? You have no idea about Pareto. There is no aggregation involved. None whatsoever, that's the entire point of it. If a small finite set of people all agree they are better off, and the rest of the larger group are at least no worse off... this must represent overall improvement, regardless of any aggregation. The problem of Pareto is nothing like what you are saying, it just happens that most actions do have widespread effect and generally someone will be worse off. These are pecuniary effects, not true externalities. Once you start making arbitrary distinctions like that, you might as well admit to doing an end run around the entire Pareto concept. Anyone who thinks they are worse off, by definition IS worse off, from their own subjective perspective. Thus, since all possible perspectives must necessarily be subjective, there's no way forward without some sub-group just slamming the fist down and declaring their own opinion to be final. In practice, that's what happens. That's what politics is all about... but nothing to do with Pareto improvement. Tel: "There is no aggregation involved. None whatsoever... If a small finite set of people all agree they are better off, and the rest of the larger group are at least no worse off." Um. Perhaps, Tel, you should look up the word "aggregation" in a dictionary. While you're browsing through the A's have a look at "all." That leaves "the rest" as yet another term denoting an aggregate, along with "set" and "group." Whether or not I have any "idea about Pareto," at least I have a clue about what words mean. If Canadians are allowed to import foreign goods, including such obviously cultural goods as reading material, music and art, won't that change Canadian culture in unpredictable ways? Why isn't free trade in goods just as big a threat to Canadian TFP as open immigration? And, granting (for the sake of argument) enormous uncertainty about cultural consequences, we still have little reason to privilege the status quo (of almost free trade plus serious restrictions on immigration)--why would our uncertainty make us favor *that*, when very different restrictions *might* be *much* better? Finally, some policy of *forcibly exporting* people might well improve Canadian productivity, even in the long run (in the short run it's a no-brainer). Generally, if our uncertainty is as great as you make out, so that we are just blindly worrying about what *might possibly* happen, we (at least, the consequentialists among us) will not be able strongly to support *any* particular policy. James: "Finally, some policy of *forcibly exporting* people might well improve Canadian productivity, even in the long run (in the short run it's a no-brainer)." Sandwichman: Mastery of English will do you no good here; this is cconomics. 'Aggregation' is being used in a narrow sense here: Pareto was trying to finesse the problem of adding 'utility' across individuals - how could I know that my pleasure/pain is commensurate with yours? But notice that he does this by eliminating measurement entirely. Essentially, it gives a veto to every individual; neither the number of vetoes, nor the intensity of any individual's rejection, matters. This is why Farmer erred to say that a non-Pareto state is 'very bad indeed', why it is grossly misleading to use the terms 'optimal' or 'improvement' with 'Pareto' - they apply only as a degenerate case. I think the term 'Pareto stalemate' is the best description of a state from which any change is a loss: stalemate in chess describes a situation in which no further move is permitted by the rules of the game. That is all a Pareto state amounts to. Sandwichman > Um. Perhaps, Tel, you should look up the word "aggregation" in a dictionary. While you're browsing through the A's have a look at "all." That leaves "the rest" as yet another term denoting an aggregate, along with "set" and "group." Whether or not I have any "idea about Pareto," at least I have a clue about what words mean. In economics, aggregate utility (or whatever) means that we'll take a net positive as an overall improvement. Someone's large positive will more than cancel out someone else's smaller negative, and we can accept that as an aggregate improvement. As Tel explains, this concept of aggregation does not apply to Pareto improvements, where no one is allowed any negative. Subjective evaluation makes summation of utility into a single quantity impossible. Obviously interpersonal utility comparison is not necessary, nor even a consideration, if all you want to do is group people into a set. People can be grouped into a set based on anything you like... hair colour, length of toenails, quantity of naval lint. I'm going to ignore your legalistic nitpicking attempting to reinterpret what Pareto is about, since all you are demonstrating is that you have no idea what Pareto is about... but I might have already mentioned that. I would be much obliged if you would DOCUMENT your claims that in economics -- or more narrowly in Paretian economics --"aggregate" ONLY refers to quantitative sums and cannot refer to mere groups, such as "all." If you can't document it with credible sources, I'll have to interpret it as simply a pseudo-science cult practice qua Malinowski's description of magic, "magic is surrounded by strict conditions: exact remembrance of a spell, unimpeachable performance of the rite, unswerving adhesion to the taboos and observances which shackle the magician. If any one of these is neglected, failure of magic follows." My understanding of Pareto comes entirely from secondary sources, most of them critical (some of them very, very critical), so you will forgive me if I am unaware of all the eccentric meanings of words that are required to be to have a coherent conversation about Pareto. I do know, however, for a fact that "potential" Pareto improvement via a Kaldor-Hicks compensation principle is an utterly incoherent and fallacious argument. It seems to me that Kaldor-Hicks fiasco exemplifies the kind of mental masturbation that results from trying to "apply" Pareto's peculiar achievement to the real world. Ken, I am aware that Pareto was attempting to finesse the problem of interpersonal comparisons of utility. As I understand it, the attempt must be judged either a failure or a "success" of such extreme abstraction as to have no relevance to real world questions of allocation or distribution. My comment was in response to Avon Barkdale's question, "But didn't a Pareto improving trade happen?" So the alleged narrow technical meaning of aggregation you invoke is moot. As for who is doing the "legalistic nitpicking," Tel, I was referring to a generic, common usage of the word aggregation. It was you who invoked a supposed "technical" meaning of aggregation that allegedly excludes its common sense non-quantitative senses. SHOW ME THE EVIDENCE: authoritative sources, please. Otherwise it's just another instance of the routine bullying that pervades economic discourse. "As Tel explains, this concept of aggregation does not apply to Pareto improvements, where no one is allowed any negative." As I recall from my readings, someone -- perhaps it was Chipman -- argued that "potential Pareto improvement" AKA Kaldor Hicks compensation principle was already implicit in Pareto's exposition of his concept of what would constitute an improvement. I'll see if I can find that argument. Yes, it is in a 1976 article by Chipman, "The Paretian Heritage" in which he cites an explicit treatment by Pareto of the "compensation principle" on page 92. The two paragraph citation is from page 60 of Pareto, Vilfredo," II massimo di utilita dato dalla libera concorrenza," Giornale degli Economisti , 9 (July 1894), 48-66. "all you are demonstrating is that you have no idea what Pareto is about"
I've showed you mine. Where's yours? we shall say elliptically that social utility increases. if some dλ₁'s are positive and others negative, this means that the utility enjoyed by certain individuals increases and that of others decreases. It is not possible to offset these various utilities against each other since they are reckoned in different units. An outright warning NOT to do the very thing you are accusing him of. There's also the following warning on the topic of equality / inequality. This gain can be distributed among all the members of society, of only among some; this is a question which I shall not now examine -- it is enough to point out its existence. So it was already understood that inequality may happen, but that aspect was simply left for another discussion another day. Otherwise it's just another instance of the routine bullying that pervades economic discourse. Bullying... HELLO? KNOCK KNOCK? ANYONE IN THERE MCFLY? In neoclassical economics, an action done in an economy that harms no one and helps at least one person. The theory suggests that Pareto improvements will keep adding to the economy until it achieves a Pareto equilibrium, where no more Pareto improvements can be made. Also a mention that Pareto improvement is a subset of Kaldor-Hicks improvement. (game theory, economics) A change in the allocation of a resource to a set of individuals that is an improvement for at least one and no worse for any other. Conditions under which the state of economic efficiency (where no one can be made better off by making someone worse off) occurs. Also called Pareto optimal or Pareto optimality. See also Pareto principle. Yeah, OK, I see what I'm dealing with here. I would be a fool to argue with someone of your capabilities. And so concludes another episode of the Dunning-Kruger/Nyhan-Reifler hour. Tune in next week for "All your base are belong to us." So it's not hypocrisy when you do it, right Sandy? Do what, Tel? What's your beef? I have yet to see any documentation of the astonishing claim that, contrary to standard usage, the whole does NOT refer to a collection of disparate elements in economics. I am not holding my breath because I'm pretty sure such a weapon of math destruction does not exist. I'm not interested in playing schoolyard semantic games with a sophist. End of conversation. Knock it off guys. You are way off-topic anyway. It's a fair theoretical point but its application is limited. We know that the economic effects of immigration that we can measure are generally positive in the aggregate, and if you consider the immigrants themselves in your social welfare calculations, they are extremely positive. What this is saying is that there might be some other stuff that will happen, perhaps, maybe, possibly that would mean the effects could be better or worse or who knows. It's interesting to think about but we should base our conclusions and prescriptions on what we actually know. And if you want to play the endogeneity game then we can. Fine, institutions are endogenous. Aren't then the immigrants endogenous? If you have good institutions wouldn't that attract exactly the kind of immigrants who have a preference for these very institutions? Which would just reinforce them and maybe even create a virtuous cycle? notsneaky: Now we're back on topic, thank God! "If you have good institutions wouldn't that attract exactly the kind of immigrants who have a preference for these very institutions? Which would just reinforce them and maybe even create a virtuous cycle?" That's the best-case scenario. Let there be 2 possible institutional systems. We don't even have to say which one is "better" than the other, just that some like living under A and others like living under B. Then let the people flow both ways, and an initial cluster of 51% A's/49% B's in one area, and 51% B's/49% A's in some other area becomes 100%/0% in both areas. But that is not always what we observe. We tend to see one-way flows. A very large percentage of people in poor dysfunctional countries want to move to rich successful countries. And we are forced to ask the question: do all those people who want to move actually subscribe to the institutions that create those good things, or do they just want the good things without subscribing to the institutions that create them? Because if such a large percentage really did subscribe to those institutions, how come those poor dysfunctional countries aren't rich and successful already? And multicultural relativism in the rich successful countries only makes the danger worse. So the Jews fleeing Germany in the 30s is because they couldn't get their home institutions right? They were partly to blame? "Because if such a large percentage really did subscribe to those institutions, how come those poor dysfunctional countries aren't rich and successful already?" I don't know Nick, I think the fact that you're asking this very question sort of goes back to whether you want to be proud or despair over economists' supposed autism. Is it really that hard to think of multiple examples - which don't have anything at all to do with immigration - of societies in which a large percentage of people would prefer different institutions than the ones they actually had to live under? It's a bit like asking why there was slavery in the American south even though there was this very very large group of people who would have preferred something else. It's a bit like worrying that the fugitive slaves who ran away up north were going to bring the system of slavery with them or something. The people who emigrate are not the ones who had chosen the institutions in their home countries (and in fact, that may very well be a big part of reason why they emigrated). It's a bit like asking "if so many Cuban-Americans really do believe in democracy and relatively free markets, how come present Cuba has neither?" I think that'd get you weird looks. My training is as an economist, but I ran my university's Canadian Studies program for a decade and in teaching in it spent a lot of time thinking and reading about Canadian values and immigration. These things do evolve, and it is realistic to think that our evolving population will affect them. But from my perspective I'd almost be prepared to argue that the values we hold dear in Canada are as much the result of immigration by "others" who we thought might not fit (and this goes back a long ways) and the change they brought as they are the product of the "old stock" Canadians (who among other things were incredibly racist, at least by today's standards). I think our values will survive. Lord knows they survived letting Nick in. It would be reasonable to exclude both the best-case and the worst-case scenarios. That leaves us with the vast middle in which most immigrants would probably have only the foggiest notions about "institutions" -- democratic, capitalistic or otherwise. And maybe that's even a good thing. Witness the gun-toting, second-amendment spouting fanatics in the U.S.A. who suppose they know how to interpret their pocket constitutions. If the answer to Nick's questions about the exogeneity of Total Factor Productivity and social/economic institutions is "No," which I think is the only credible answer, then the next question has to be "why am I even asking these questions instead of more salient questions about ethics and moral sentiments?" In my view, the answer to that question goes back to the futile -- and bad faith -- urge to exclude "value judgments" from "economic science." "I think our values will survive. Lord knows they survived letting Nick in." They also let me in. Our values cancel each other out. I'm going to try to keep on good terms with you folks, since I might be requesting you let me in depending on how the election goes down here. Should I start getting acclimated to "poutine" now, or do you think I can transition relatively quickly? Hi Jim! "I think our values will survive. Lord knows they survived letting Nick in." One case for optimism is that the Protestant/Catholic split, which used to be such a big deal in Canada, has now mostly disappeared. But then religious denominations aren't the big deal they used to be. But I worry a lot less about Canada than I do about other countries. EU countries for example, at the moment. Did you ever get exposed to any of the Innis stuff? Especially with your stint in Canadian Studies. I know Robin Neill was into it. It seems to have pretty much disappeared from economics, AFAIK. Tom: poutine is easy, provided you only eat it after a few days canoeing. But admitting that 1776 and all that was an unfortunate mistake, and swearing loyalty to Her Majesty, would be the thing. "But admitting that 1776 and all that was an unfortunate mistake, and swearing loyalty to Her Majesty, would be the thing." No problem!! I'm willing to call 1812 in your favor too. Nice going BTW: burning Washington DC down and all... very impressive! For all it's shame and drudgery, bad presidents, and philandering congresses, the United States is still a wonderful country and humanity's best hope. Just look at the gravity wave discovery this week. There is no way that gets off the ground without American leadership. Early this summer humanity got to see the surface of Pluto, again because of American leadership. Planet Earth is lucky to have enjoyed the American experiment. Sorry Nick, I wondered off topic a bit. Tom: in my opinion, unless you have a "conservative" (as you have defined it) immigration policy, you run the risk of a Trump coming along, smashing some Overton windows. Same in Europe. Nick - I've actually read a lot of Innis, partly Robin's fault. His Staples theory stuff still lingers on a bit in economic history, but I always found his communications theory writings a bit more interesting. In some ways following him on that technology seems a more obvious threat to Canadian values than immigration. Jim: " In some ways following him on that technology seems a more obvious threat to Canadian values than immigration." One of my really wacky ideas is that self-driving cars will be a bad thing for that sort of reason!